Climate change is one of the wickedest challenges facing human kind. We need substantial, disruptive innovation in sustainable technologies and business models if we are going to have any hope in mitigating and adapting to the impacts from climate change. Disruptive in the sense that existing technologies will need to yield to zero-emissions alternatives likely causing a reconfiguring of the existing competitive order and the emergence of new companies and business models. And substantial in that such disruption needs to occur across multiple industry sectors from energy to transportation to agricultural to industrials to the built environment. In this highly-politicized moment in the United States, we may be forgiven for being doubtful that any of these actions are likely to occur. Yet, we have reason for hope. The policy actions outlined do not necessarily require federal action. A coalition of willing and determined stakeholders – mayors, governors, corporations, NGO’s, entrepreneurs, investors – are already pushing for many of the actions outlined in the playbook. What we need next is collaboration among these stakeholders to coordinate and scale those actions. As I argue in my new book with Ronnie Chatterji, Can Business Save the Earth? Innovating Our Way to Sustainability, we will only be able address our sustainability challenges broadly, and climate change specifically, if we catalyze our innovation ecosystem. This requires a concerted effort by a collection of stakeholders each pulling levers available to them to move the system along. 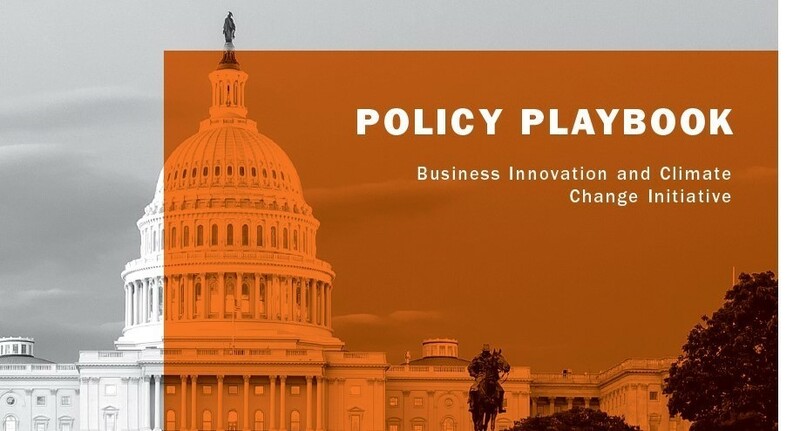 The Policy Playbook provides some great guidance on what some of those levers could be. Now is the time for each of us to step up and to inspire action.